Is your next vacation destination on the list of top bed bug cities? No matter what your vacation style whether it’s fun in the sun, hitting the ski slopes, Broadway shows, or maybe some gambling, bed bugs could be awaiting your arrival. You certainly don’t need to cancel your travel plans that are already made but to help avoid encounters with bed bugs, we wanted to remind you of a few bed bug prevention tips before your plane takes off. Pack your clothing in large bags that seal shut like Ziploc bags so that bed bugs cannot get into your clothing and hide. 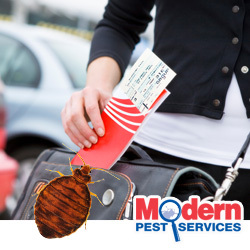 Inspect your surroundings for any bed bug sightings on the plane, in the airport, even in the taxi. Before settling into your hotel room, inspect it for bed bugs. Signs of bed bugs include dark spots on the sheets and mattress, shed skins, and of course live bed bugs. Do not just inspect the bed but also the headboard, night stands, near the edges of the carpet, in the upholstered furniture, even near the electrical outlets. A flashlight and magnifying glass is handy since bed bugs are great at hiding in dark crevices. Instead of unpacking all of your clothing and using the dresser and closet space provided, work from within the suitcase and keep your clothing sealed in the large plastic bags. Use luggage stands to keep suitcases up off of the floor for added bed bug protection. Of course it is possible that even with your best efforts put forth in bed bug prevention, these blood sucking critters could find a way back to your home in Maine, Massachusetts or New Hampshire. Keep an eye out for any signs of bed bugs as well as waking to itchy, red bed bug bites and be sure to contact Modern Pest Services if you believe your home has a bed bug infestation. Our bed bug treatments are the ideal solution to get rid of bed bugs quickly and efficiently. While bed bugs do not spread any diseases, they are certainly not a pest you want hanging around. So matter where your next vacation destination, be sure to travel smart so that you can avoid bed bugs!